Japan IT Week Spring 2019 (Part Two) in Tokyo is Japan's leading event and business platform for IoT and embedded system industries, Industrial computing platform manufacturer GIGAIPC will also seize this opportunity to serve our potential customers in Japan. 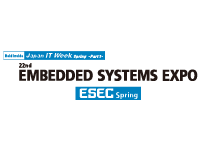 Our best team will present our latest developments in embedded solution. Please feel free to come by and let us know your requirements. Please visit GIGAIPC at booth 2-15, and let us share with you our latest and greatest embedded systems.